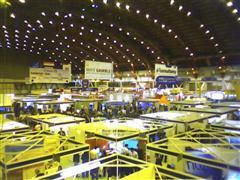 London Internet World exhibitors have filled three quarters of London Olympia 2 hall for the first time since the 1999 and 2000. That is 171 exhibitors, and a projected 10,000 visitors. With no less than three mapping services in attendance; streetmaps.co.uk, multimap.com and mapsolute, compared with only mapquest.com in 1999. Heady stuff. The rumor is that boo.com, the £185m disaster the UK internet bust flagship, will be resurrected this year.